Nowadays, engineering research on aero engine cooling can be found...in the museums ! 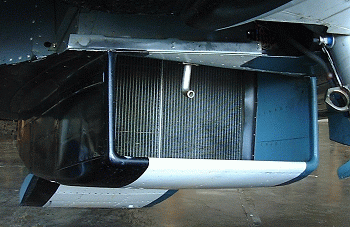 Since the '50s, aeronautical engineers are no longer studying piston engine cooling. Design rules of the older designers are gradually being lost or forgotten, and have given way to a set of "recipes". Research on the subject halted in the '40s. There are good reasons : the prohibitive cooling drag of piston engines at high speed and altitude, hastened the advent of the jet engine, which requires only minimal cooling. Piston engine aircraft now only amount to a tiny proportion of the overall production. Cooling an object is transferring part of its heat to another, raising its temperature. In a piston engine, the heat from the combustion in the barrels and cylinder heads travels through the metal walls. 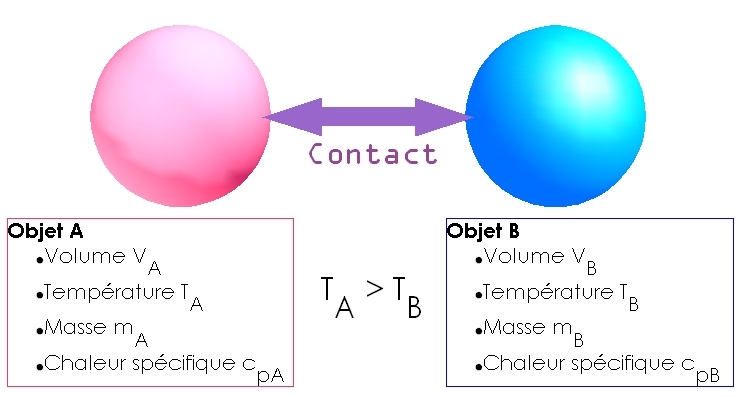 It is then transferred by conduction and convection to a cooling fluid, air or liquid, which will dissipate it in the environment. In the case of liquid cooling, an intermediary coolant is heated by the engine and flows through the tubes of a heat exchanger or radiator. The airflow across these tubes ultimately transfers heat to the atmosphere. It is often wrongly believed that a radiator or finned barrel directly exposed in a free airstream will achieve efficient cooling. Actually, less than one third of the air arriving in front of the radiator will effectively flow across the core. The rest will flow around the obstacle, not without violent turbulence. The efficiency is poor and the drag is prohibitive. In order to cool, air must flow through a radiator, with a mass flow easily determined by calculation. 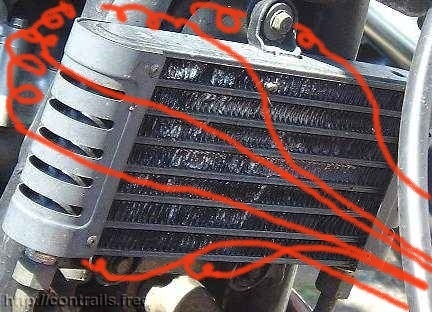 It is the pressure difference between the two faces of the radiator core, which forces air to flow through it : the ΔP. Without this pressure difference, no flow through the core, no cooling. There is a drawback : ΔP implies higher pressure on the front face, and lower pressure on the rear face. The resulting rearward force corresponds to a drag. Measurements and calculation have shown that cooling is inseparable from friction between the air and the radiator core walls, and from the pressure difference between the faces of the radiator. There is no cooling without drag. The art of the designer/homebuilder consists of cooling while paying only the "inevitable" drag, by minimizing parasitic drag. It is always possible to cool an engine. It is not frequent to achieve so with minimal drag. Some ultralight or airplane builders even combine prohibitive drag and insufficient cooling ! 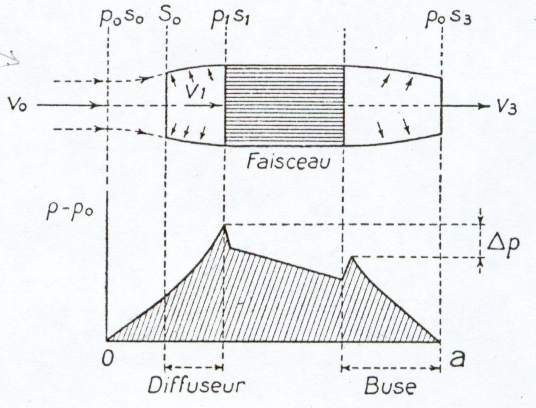 In first approximation, the heat transfer between the core or finned cylinder head and the air is proportional to the air density, to the friction coefficient, to the mean air velocity across the fins (i.e. the volume flow), and to the temperature difference ΔT between the air and the fins or the liquid in the radiator. The power needed for cooling is proportional to the square of the airspeed across the fins, and inversely proportional to the temperature difference ΔT between the air and the core or cylinder fins. It is independent of the density of air. Thus convection cooling is economical only at low velocity, with temperature differences as high as possible. Those results apply to radiators as well as air cooled barrels or cylinder heads. To minimize internal drag, we thus need a core with sufficient area (volume flow), an airstream considerably slower than the aircraft airspeed, and as high a Delta T as possible. There is thus some advantage in running the engine as hot as compatible with safe operating limitations. 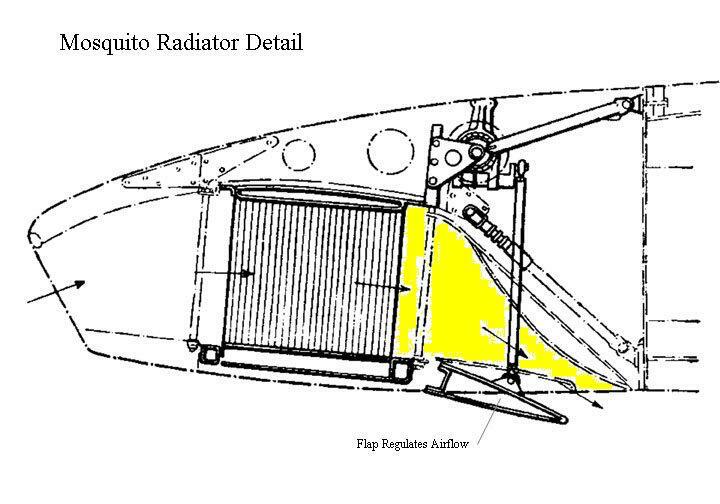 The role of the fairing is to facilitate the slowing down of the air at the face of the radiator, to increase static pressure to overcome the pressure drop across the core, and to use pressures on the internal and external walls to reduce the overall drag of the assembly. Those points are common to any internal flow systems. The primary task of the designer is to avoid any flow separation. It is the most important part of the duct. It comprises a diverging portion (not funnel shaped) in order to slow down the airflow without causing any separation. According to Bernoulli's law, slowing air with no separation raises the static pressure. 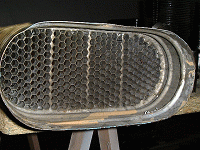 The presence of the radiator aft of a well designed diffuser renders flow separation still less likely. 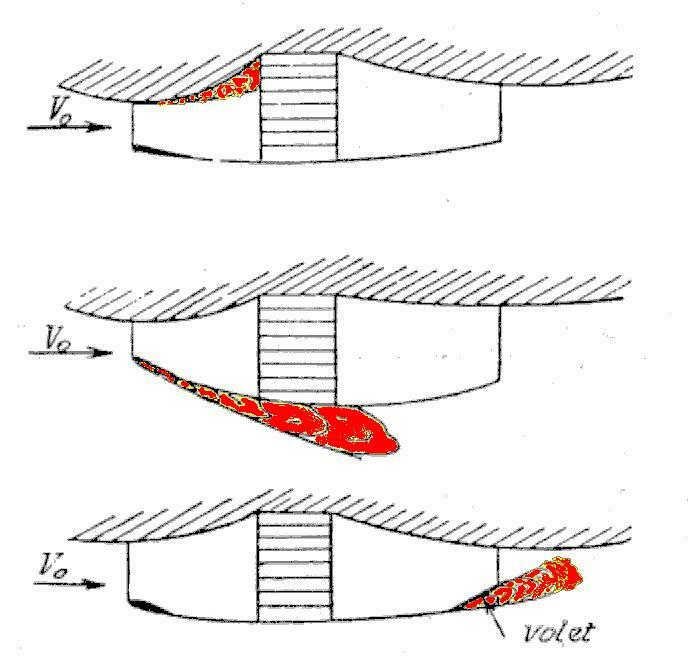 The gain is twofold : the increased pressure facilitates the passage through the core, and this pressure on the diverging walls of the diffuser results in a forward force, opposing the drag of the core. The external shape of the diffuser is also important : the air which does not enter it flows around it. With no flow separation, the air acceleration around the lip and front portion of the diffuser results in an additional forward lift force. It is thus possible to counterbalance most of the radiator drag. It has been shown that the diffuser efficiency is key in the reduction of the overall radiator drag. It is the most critical part, and unfortunately the most frequently botched by homebuilders. 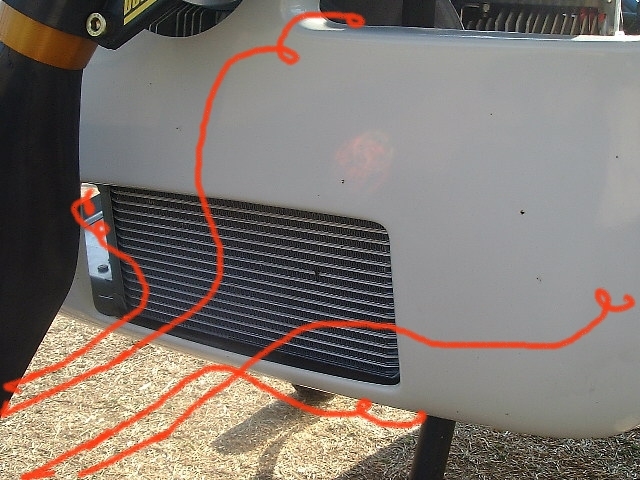 At the radiator exit, the air pressure is lower (pressure drop), its temperature has increased, and so has its volume. 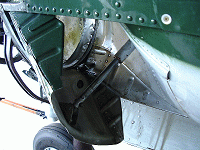 A converging exit (nozzle) allows air re-acceleration and by reaction, creates a forward force. Ideally, discharge air should exit with a velocity and direction as close to the main air stream as possible. 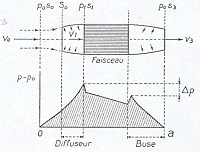 The design of the converging nozzle is not as critical, since separation is less likely due to flow acceleration. Many designers "forget" the nozzle at the exit of the radiator, thus wasting kinetic energy. For optimal cooling, it is necessary to maintain a given mass flow, increasing the cross section of the air stream feeding the radiator in a climb and reducing it at high speed. In theory, it should be necessary to alter the intake opening at the same time as the exit. 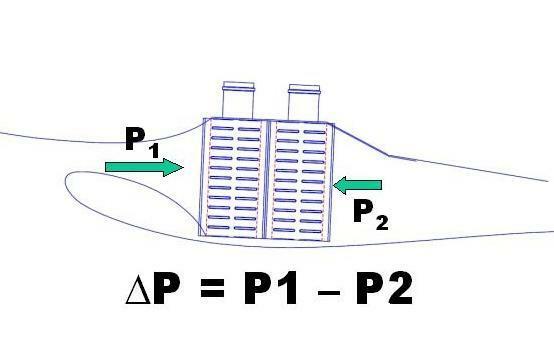 In practice, it has been shown that once the intake cross section is 30 to 50% of the radiator block frontal area, the volume flow depends only on the exit area. Hence the regulation by control of the exit area by means of cowl flaps, preserving the static pressure at the front face of the radiator. If the air intake and fairing are properly designed, it is possible to avoid any flow separation, be it internal or external. The early radiators had a honeycomb matrix : it consists of an array of copper tubes, flared at the ends and tin soldered together. The air flows lengthwise through the tubes, whereas the liquid to be cooled flows around them. This simple to build core offers the same wall area to the air and the liquid. For optimized heat rejection, the surface in contact with air should be considerably larger than that offered to the liquid. Common in the '30s, this type of core can still be found in oil radiators in large piston engines, jet engines and turboprops. 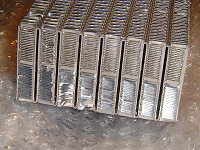 Modern radiator cores are of the finned flat tube type. The coolant flows in flattened aluminium tubes with brazed fins to increase the exchange area in contact with air. This type of core offers good pressure resistance. At the ends of the core are end-tanks to supply the coolant to the different tubes. 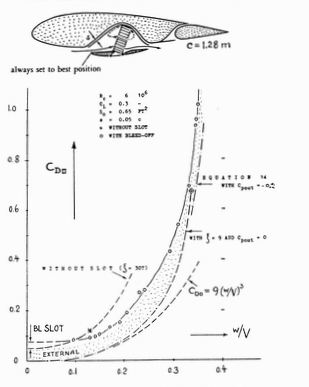 Küchemann (Cf bibliography) shows that for the heat transfer to be large, the Reynolds number in the air passages should be low, the passage cross-section should be small, and the core should be long. Roughness in the passages increases the pressure drop but does not increase heat transfer. 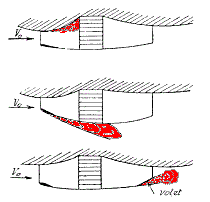 Nevertheless, properly corrugated fins improve convection. Likewise, fins slotted in a louvre form provide new stagnation points with laminar boundary layer and lower local Reynolds numbers. Please note the smooth louvered fins on the picture. In 1935 British aerodynamicist F.W.Meredith published a note on the possibility to obtain a thrust by use of the heat from cooling radiators. Within the next few months, German, French and American aerodynamicists included his data into their studies. The Meredith Effect was born. During the years '35 to '38 German aerodynamicists established the basis of the aerodynamics of the radiators. Translations of their works are downloadable from the NACA website. In France, Louis Bréguet and his chief engineer René Devillers published in 1938 a summary of the knowledge of the time. Understandably, American research mainly focused on air cooling : they only produced one operational liquid-cooled engine. The second World War saw a number of works on liquid cooling refinements, with very few changes from the prewar basis. The aerodynamicists of the NACA corrected the cooling of a certain number of aircraft, whose designers had (already !) forgotten the basic rules. From 1943 onwards, research moved towards high speed aerodynamics and jet engines, and the knowledge on piston engine cooling began to wane. 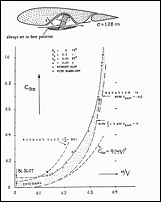 After the war, German aerodynamicists published an English survey of their works : Hoerner, Küchemann & Weber. During the years 60 to 80, Miley published several studies on the cooling of aircraft engines, based on the knowledge from the '40s. These are the last known studies on the subject.